Catalyst Conversations is a series featuring people who are using their talents and unique experiences to connect and shape new perspectives. 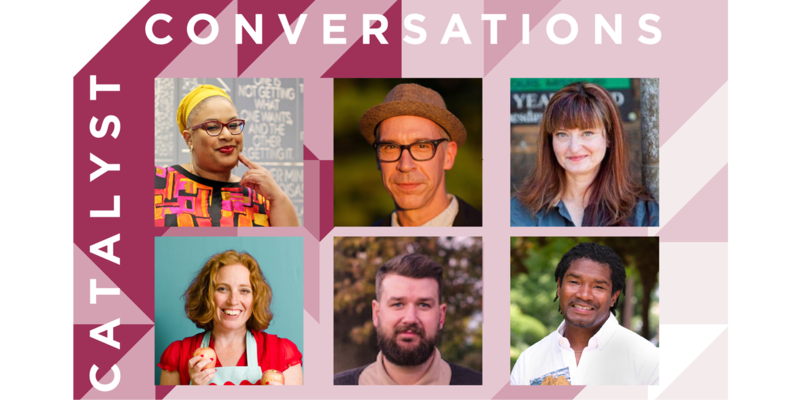 This October marked the debut of the Arts and Education Council’s (A&E) Catalyst Conversations, a series featuring people who are using their talents and unique experiences to connect and shape new perspectives. We are looking forward to these discussions—some playful, some serious, but all engaging and thought-provoking. Here’s what you can expect from this new series. This isn’t going to be a lecture or speaker series. When crafting this series we thought back to historic artist salons where people gathered to learn and amuse themselves. Each Catalyst Conversation will allow opportunities for true discussion. Come ready to ask questions of our guests and hosts. Some conversations will be playful and some may be more serious, but they’ll offer an opportunity to consider new perspectives. For instance, on Nov. 13, we’ll learn who Hana Sharif, the next artistic director of The Repertory Theatre (an A&E grantee), is as an artist. Host Chuck Harper said, “I am very much looking forward to diving into her ideas and passions and methods for creating theater and, along with the audience, learning more about our extraordinary new colleague.” Harper is also chair of the Department of Theater and Dance at Southern Illinois University Edwardsville and co-producing director at YoungLiars. Before each conversation begins there will be time to eat and drink while you chat with other guests. We’ll gather over appetizers and drinks in A&E’s living room for the arts, Catalyst Innovation Lab. We imagine just as many excellent conversations will occur during the informal part of the evening as when we sit down with our guests and hosts. Join us for Catalyst Conversations monthly from 5:00 – 7:00 p.m. in the Centene Center for the Arts. A cocktail hour will start at 5:00 p.m. and the conversation will begin at 5:30 p.m. Catalyst Conversations is a free program but due to limited space, registration is strongly encouraged. For more information and to register for upcoming Catalyst Conversations, click here. To keep art happening throughout the St. Louis region, support programs like the Catalyst Conversations with a gift to A&E today.